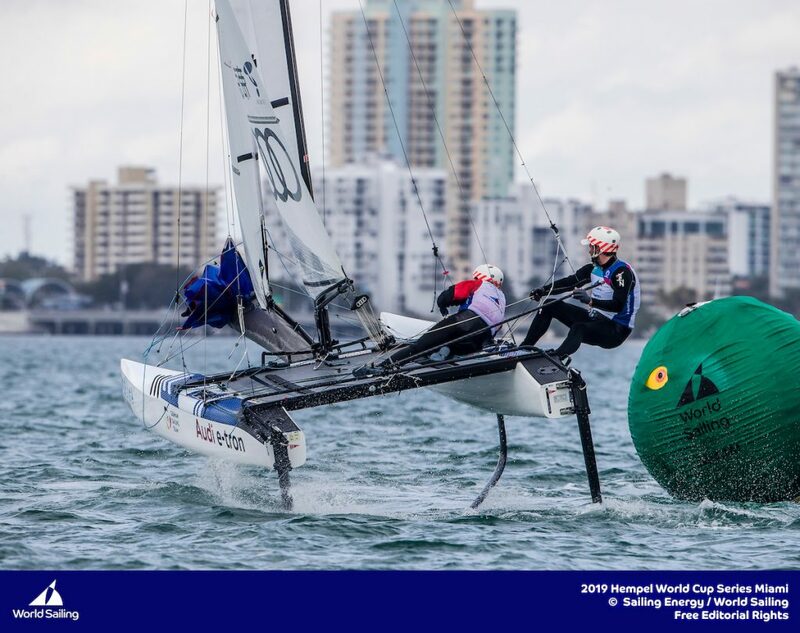 Fresher breezes meant lots of foiling for the Nacra 17 fleet at the 2019 Hempel World Cup Series Miami. 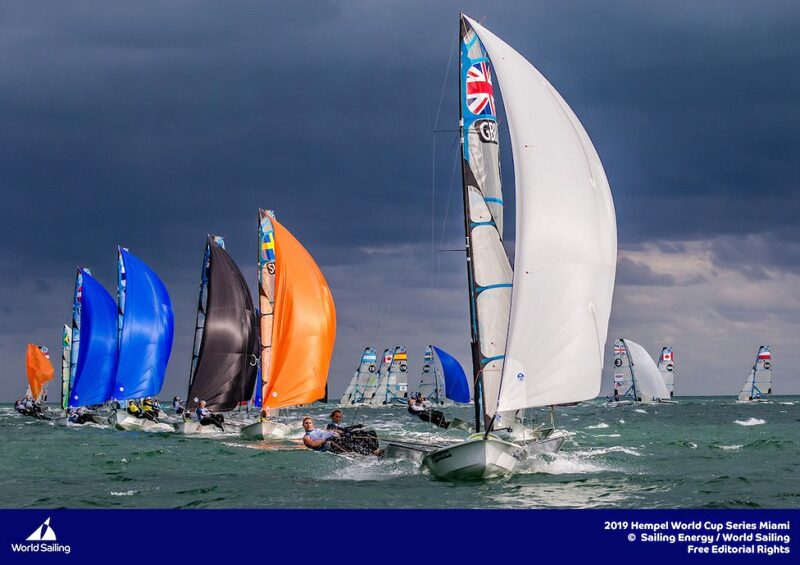 It was was something of a microcosm of the regatta so far – all about surviving the storm and limiting the damage. 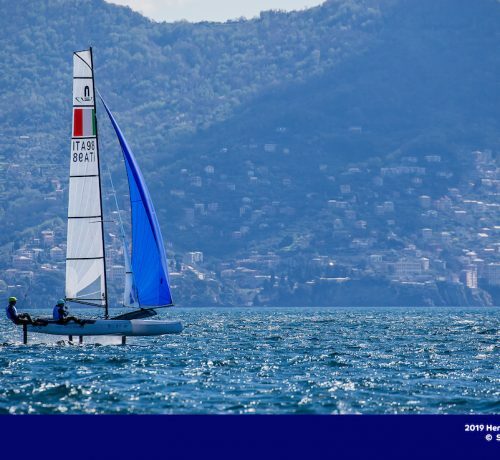 The Nacra 17 fleet ripped through four races today and is on track to complete its scheduled 12 before Saturday’s Medal Race. 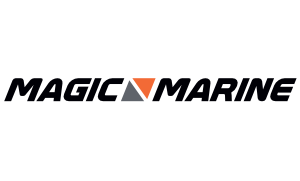 The increased also restored some normalcy to the standings after a lot of inconsistency over the first five races. The top two boats have started to edge away from the fleet. Samuel Albrecht and Gabriela Nicolino de Sá (BRA) maintain the overall lead, but have just four points over Jason Waterhouse and Lisa Darmanin (AUS). Third place, John Gimson and Anna Burnet (GBR) is 16 points further back. Four races today have the 49er class nearly back on schedule. In no fleet has consistency been more elusive. With a pair of race wins to close out the day—after a 17th and an eighth to start it—Rio 2016 bronze medalists Erik Heil and Thomas Ploessel (GER) are now winning by just over six points. The pair was granted average points for their first race, which accounts for the fractional score. Dylan Fletcher-Scott and Stuart Bithell (GBR) are second with Sime Fantela and Mihovil Fantela (CRO) in third. 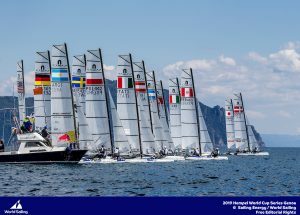 While there’s a significant point spread between first and seventh, the gap between seventh and 14th is much tighter, which will set up a particularly fierce battle tomorrow as everyone aims for a place in the top 10 and a chance to compete in the Medal Race. 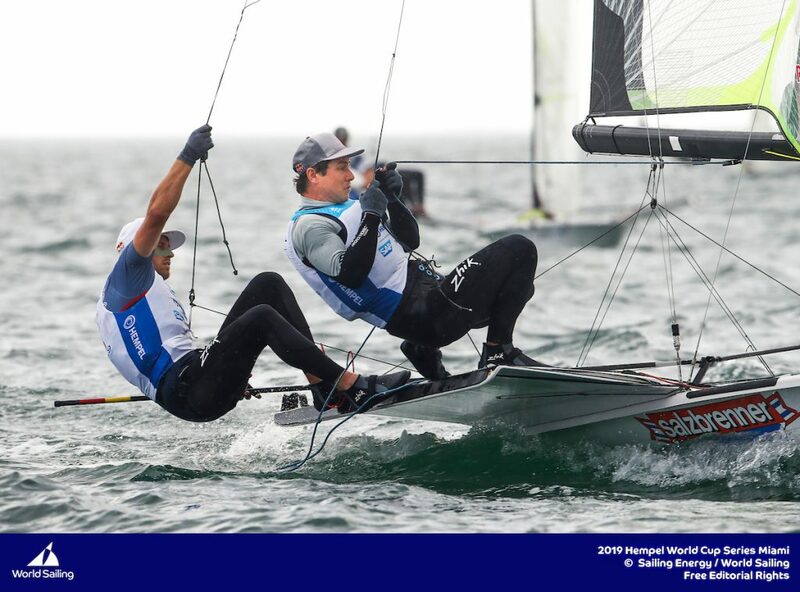 Alex Maloney and Molly Meech (NZL) held on to their lead in the 49erFX after a fifth and an 18th, which they discard, from two races. The Kiwis are five points clear of Great Britain’s Charlotte Dobson and Saskia Tidey who claimed a first and a fifth. 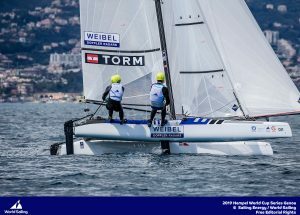 Ida Marie Baad Nielsen and Marie Thusgaard Olsen (DEN) took the other victory and they are 16th overall. Racing resumes once again at the earlier time of 10:00. The 49er, 49erFX, Nacra and RS:X fleets will sail their final day of qualification ahead of Saturday’s Medal Races.